Living a Crafting Life: Scrapology Class: Flipping for Spring! 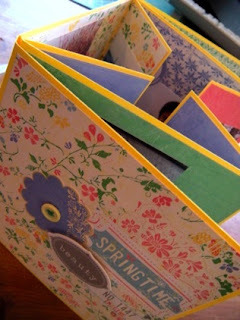 Scrapology Class: Flipping for Spring! Another fun project for a Scrapology class! I used some new papers, stickers and chipboard from The Little Yellow Bicycle's Fresh Print Clothesline set, which are so springy, sweet and oh so perfect for doing an Easter or flower album! I used several photos that I took on Easter Sunday of the bluebonnets and other wildflowers here in Texas. 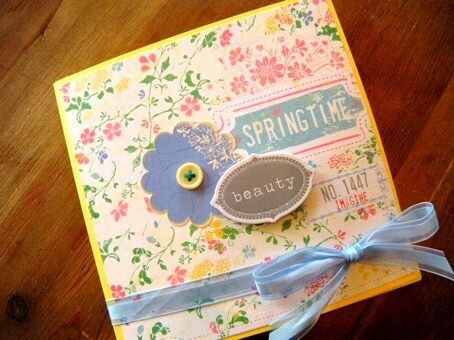 The "springtime" imprint here is on the paper -- I thought this made a perfect album cover! Card Making Process: Say Cheese!